Click here to listen to the interview. Opens in new window. You'll be £25.00 closer to your next £10.00 credit when you purchase Bombing Germany: The Final Phase. What's this? During 1942 and 1943 the striking power of RAF Bomber Command was transformed by the arrival of heavy bombers, advanced navigation and blind bombing systems, and new tactics to concentrate the bombers over the target and swamp the German defences. By October 1944 most of Germany's cities were in ruins, yet the bombing continued to intensify, reaching unprecedented levels in the final seven months of the air campaign. The value of further area raids was questioned during the opening months of 1945, yet the Allies destroyed the remaining cities in a bid to hasten the end of the war. The handful of German cities still largely unscathed in early February 1945 included Dresden, which was obliterated on 13 February. Ten days later, the South German city of Pforzheim was destined to suffer the same fate. This book commemorates the efforts of the aircrew members who risked their lives, consolidating a host of intriguing first-hand accounts. It also considers Pforzheim as a representative community under National Socialist rule. The city's survivors remember the horror of the raid and its aftermath, including eventual occupation by French Colonial troops and, subsequently, American forces. Tony does an admirable job of presenting historical context when considering actions in times of extreme trauma and his narrative offers an intriguing, engaging and poignant evocation of the closing months of Bomber Command's war. This is a very 360 degree history that details events from almost every angle and perspective. The author has gone to great pains to articulate the views and opinions of the German factory workers who were bombed, the families of those workers and of course those involved in Bomber Command. I found the narrative enlightening as I had not realised just how much bombing had carried on after Dresden. The Eagle, Glider Pilot Regimental Assc. 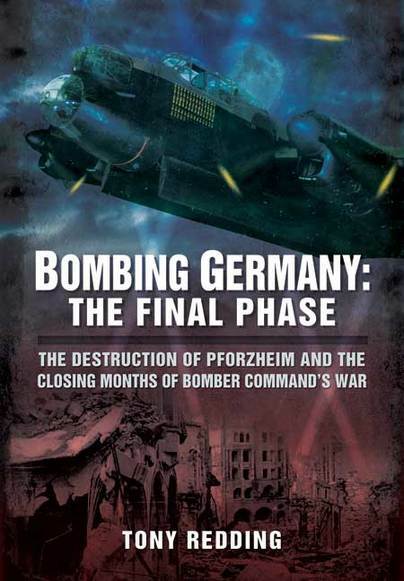 The text flows smoothly and the illustrations are spread through the body of the book...This is a very good account of the last phase and every air war enthusiast will want a copy...The author has presented a complete and well-researched account of the final phase of the bombing war in Europe. A book well worth reading. This book is a truly sobering account of the human cost, military and civilian, which is well written and well illustrated. Offers a rare portrayal of the horror of area bombing from the personal accounts of German civilians as well as British aircrew. As featured on BBC South East Today. Anthony Redding is a journalist and international specialist in the media aspects of emergency response. He is an aviation historian, with a particular interest in RAF Bomber Command. He is the author of Flying for Freedom: Life and Death in Bomber Command published by Cerberus Publishing in 2005.